Queen Margaret University (QMU), Edinburgh has just won an award for its highly successful student career mentoring project. 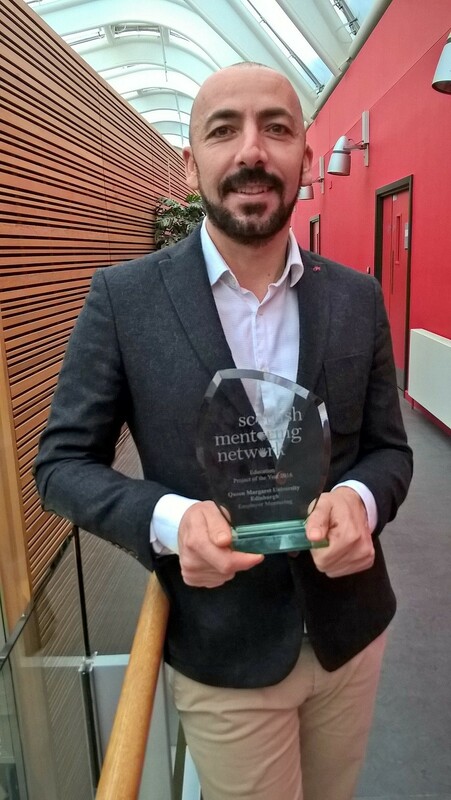 QMU’s Employer Mentoring Programme has been awarded The Scottish Mentoring Network Education Project of the Year Award 2016. The awards are designed to give recognition to mentoring projects that have made a significant impact over the past year. Juan Garcia, Employability & Development Adviser at QMU, started the mentoring project in 2013 with the aim of increasing student confidence, preparing mentees well for the world of work and developing excellent industry links and job opportunities. Over the past three years 160 pairings of students with mentors have been made. Through the project, committed and enthusiastic students are given the opportunity to meet with an experienced individual from a relevant sector, who is willing to offer their time, advice and inside knowledge surrounding the world of work. This award recognised the way the project has helped individual students in the transition from university to life after graduation. The judging panel was also impressed that the introduction of the mentoring scheme had helped to foster a mentoring culture within Queen Margaret University which encouraged senior students to mentor junior students, and where further development of initial mentoring projects was encouraged.